Joe Wood, organist and choirmaster of St. Paul's in Huddersfield, started his business in 1850 with the name of 'J Wood Music' selling pianos, and later sheet music. By 1861 he was manufacturing pianos and his business was later named ‘J Wood’s Pianoforte & Harmonium Depot’. Around 1874, Joe took on his apprentice, and brother-in-law, Joshua Marshall as his partner and the shops were re-named ‘Wood & Marshall’. In 1877 Wood extended his empire to Bradford, sending his son William to take over a music business already established there (d'Este's). 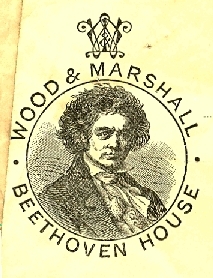 In 1882 the shop in Huddersfield was moved to 39 New Street and re-named ‘Beethoven House’. 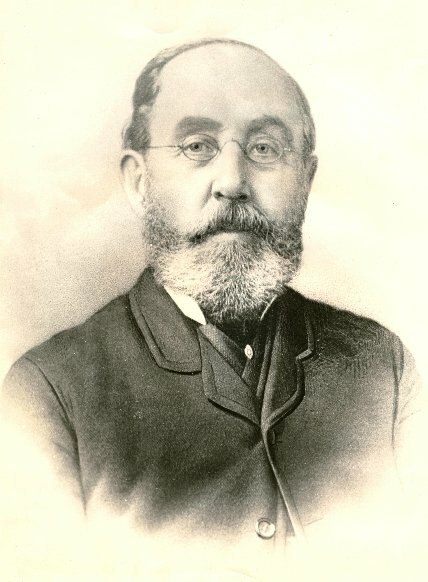 Joe died in 1884 and in 1885 Joshua Marshall was bought out of his partnership by Joe’s sons but they still used the ‘Wood & Marshall’ name together with ‘J Wood & Sons’. In 1886 another apprentice of Joe, John North, became a partner in the firm and the business became ‘J Wood & Sons & North’. North died aged 39 in 1891 and the name reverted back to ‘J Wood & Sons’ though quite often with ‘Late Wood & Marshall’ or ‘Joe Wood’s Sons & North’ printed underneath. From 1886 Joshua Marshall opened his own shops in Huddersfield and surrounding districts (Joshua Marshall & Co) but in 1902 all the Marshall's shops reverted to the sole ownership of the Wood family and the business became a Limited Company in 1903, ‘J Wood & Sons Ltd’. The business flourished all through the Victorian era and has sometimes expanded, sometimes contracted: at various times there have been shops in Halifax, Hull, Leeds and Skipton. It has also survived three fires, two in Bradford (1905 and 1977), and the other in Huddersfield (1964). In recent years, the most significant developments have taken place in the firm's Bradford arm which, after receiving in 1962 a fairly large invitation to tender for the supply of musical instruments to the old West Riding Education Authority, and after visiting in the Frankfurt music fair the stand of Moeck and meeting Otto Steinkopf, one of the earliest pioneers in the reconstruction of early instruments, initiated its specialization to Early Music and started to operate in 1968 with the name 'The Early Music Shop' and a small selection of recorders and crumhorns. 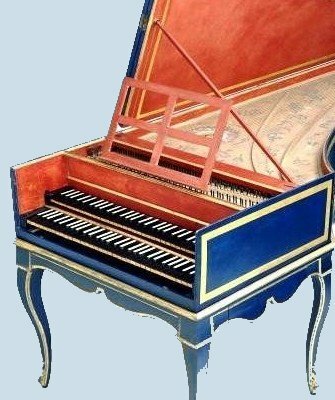 In Germany, the Early Music revival movement had begun much earlier than in England and the small workshops of Moeck Verlag, Rainer Weber and Günther Körber produced most of the world's only available early instruments since the 50s. But the Early Music Shop created much interest from local amateur musicians in the Huddersfield area, for it was at this time that David Munrow and many of his pioneering contemporaries were generating so much enthusiasm for early music. In the first years, the Early Music Shop satisfied the increasing demand for specialist recorders and viols in England, taking them from the German pioneer makers. The only viol maker in England at the time was the Swiss Dietrich Kessler and he had a waiting list of several years. As a way to get publicity without actually having to pay for it, Richard Wood though to hold an exhibition and invite those makers and publishers he was doing business with. The exhibition has been held annually since David Munrow came to the first edition with the assistance of the BBC television cameras. Supply still outstripped demand throughout the 1970s to the extend that 'J Wood & Sons Ltd.' began making their own instruments in a workshop in the firm's attic at 38, Manningham Lane in Bradford with some quite sophisticated machinery in part constructed by Andreas von Huene, son of Friedrich von Huene. Under the direction of Jonathan M. Askey, the attic became two floors of the shop, the catalogues became more comprehensive and the firm's clientele soon covered the entire globe, with agents in most countries of the world. In 1995, the firm was demerged into two separate companies. The original J Wood & Sons Ltd operated in Bradford under the name 'Early Music Shop'; the other in Huddersfield. In 1999, Richard Wood, the founder's great-great-grandson, divided again J Wood & Sons Ltd and sold separately the Bradford's showroom and workshops. The showroom was acquired by G. A. Williams of Darlington and Newcastle that continued operating it as 'The Early Music Shop' (EMS). In later years it was transferred to different owners(1). The EMS workshops, the authentic soul of the J Wood & Sons Ltd., were sold to Jonathan M. Askey -who had managed the complete business of J Wood & Sons Ltd since he joined the company back in 1972-. 'The Renaissance Workshop Company Ltd.' was the new name given to the former EMS workshops, and Mr. Askey continued to drive it. Located in the same building at Manningham Lane in Bradford, keeping all the staff recruited at the time, having been in the past part of it, and sharing the same product catalogue, the Renaissance Workshop Company (RWC) grew under the shadow of the Early Music Shop and not all the customers realised that the EMS, now owned by the Williams group, had become a mere dealer of RWC. The confusion grew up because the Early Music Shop marketed the RWC products as if they were still made in their own workshop, i.e., they continued offering the RWC production with the brand EMS. In 2004, The RWC re-established its workshops in a new premises near Toledo (Spain), still maintaining the company's headquarters and a commercial infrastructure located in West Yorkshire (UK). At Renaissance Workshop Company we take our heritage very seriously and endeavour to provide the exceptional level of service that has become a standard in our long history. Most of the information of this article has been obtained from the book 'Music Making in the west riding of Yorkshire', published by Richard H Wood and Adrian Smith in November 2000 and from the comments of Janette Hamilton (a great-great-grandchild of Joe Wood). (1) About 2004, the Williams group moved the EMS to a new location in Saltaire. In 2007, the company J Wood & Sons Ltd, trading in Saltaire as The Early Music Shop, was transferred to the Music Sales Group. J Wood & Sons Ltd finally ceased trading in 2008 and the Early Music Shop was operated as part of the Music Sales Group instead of as a separated company. But in August 2018, Chris Butler, the Head of Publishing and Rights for the Music Sales Group, announced his personal acquisition of the company J Wood & Sons Ltd, at that time trading as The Early Music Shop in the main showroom in Saltaire, and a satellite in central London, on Denmark Street.